When we design a theme park it is all about telling a story in as much detail as possible. Even so, there are always certain practical matters that must be dealt with such as lighting. Light posts (and there are plenty) also need to fit into the theme of the project. Loco Landing Adventure Park will carry a mining theme. The windmill is the generator and the power will be directed into the mine via telephone poles, which also will have the lighting attached, hiding in plain sight. We sourced some old fashioned lighting fixtures which we will age appropriately. 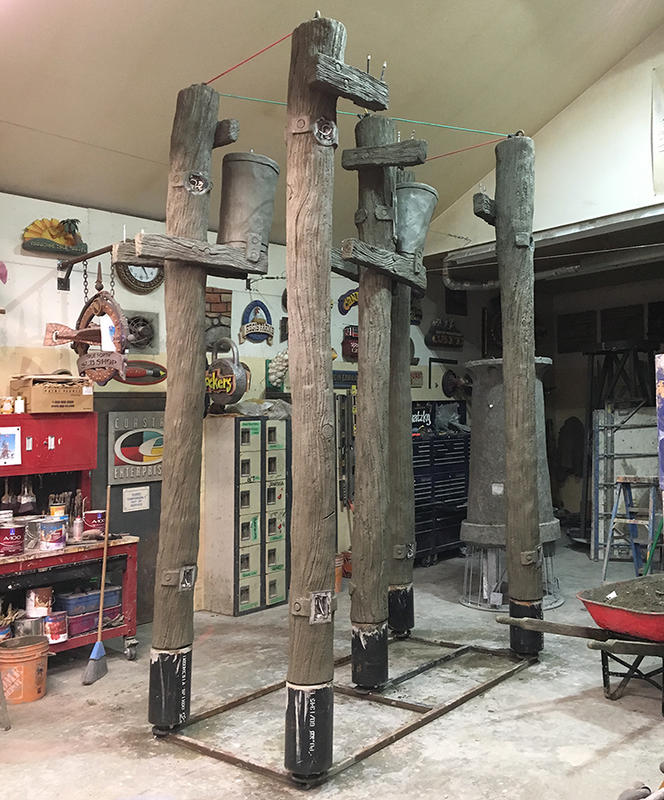 Rather than use real wood (which will quickly rot) we instead sculpted the posts from steel and concrete. We whimsically twisted and warped them just enough to make them fun!